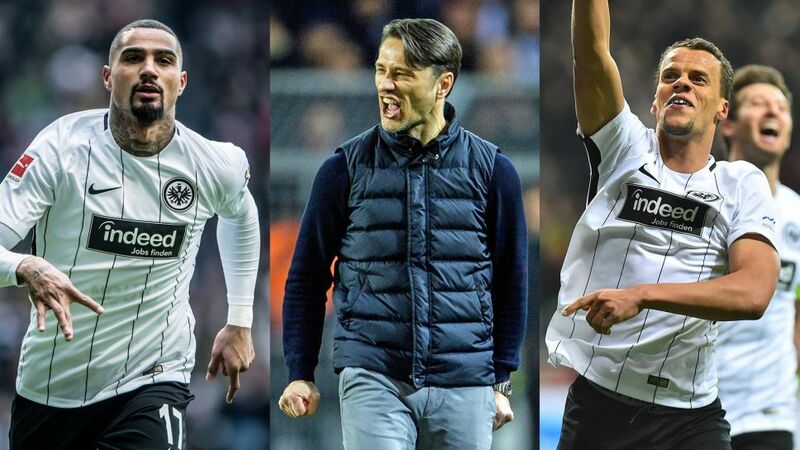 Watch: How Niko Kovac transformed Eintracht Frankfurt! Before Kovac: While Boateng's ability has never been in doubt, ill-discipline and off-field issues have prevented him from fulfilling his potential - with the player himself recently admitting he "could have played for Real Madrid" if he had knuckled down more. The fact that Frankfurt are the ninth club of his senior career - he has never spent more than three seasons in any one place - is testament to an inability to settle in his surroundings, while he received 94 yellow cards, six straight red cards and had been sent off a further five times prior to arriving in Frankfurt from Spanish side U.D. Las Palmas last summer. Boateng still has a gritty edge to his game - he wins a challenge within every seven minutes he plays, on average - but has shown much greater discipline in 2017/18, earning just five yellow cards. That has helped him become one of the undisputed leaders of the team, and he has relished being one of the more experienced players in a young Frankfurt squad. It’s fair to say that both coach and player have delivered. Kovac acknowledged the kind of talent and attitude that Boateng could contribute, giving him a central role in an attacking line-up. The former Ghana international repaid that trust in kind, leading a young squad and performing when it mattered most and has already matched his best single-season scoring tally in the Bundesliga of six goals. Although the German-born USA international has enjoyed regular game-time with the Eagles since returning to his boyhood club in 2014 from Nuremberg, he hasn’t quite been on the same level as some of the league’s top full-backs. While his flexibility to play in defence and midfield has been an asset for Frankfurt, his game always seemed to lack an edge to put him up there with the likes of Lukasz Piszczek at Borussia Dortmund or Joshua Kimmich at Bayern Munich. This season, however, Chandler has been determined to change that reaching his peak performance in Kovac’s system. Chandler’s experience at right-back and right midfield make him the perfect match for Eintracht's tactical setup, which requires its men out wide to make attacking runs to generate and finish chances on goal. This plays into Kovac’s inspired decision to switch Chandler from the right to the left side, where his strong right foot gives him a better shooting angle. The fact that his two goals this season came precisely after this change is no coincidence, but pure tactical cunning. This 22-year-old is undoubtedly one of the breakthrough players of the season. He arrived at Frankfurt on loan from Hannover in the second half of the 2016/17 campaign. Despite only getting three games under his belt before suffering a shoulder injury that put him out until the summer break, Kovac saw potential in Wolf and entrusted him with manning the right flank for the current season. And we’ve already covered how important that specific role is. His stellar performance in the first half of the season was enough for Frankfurt to offer him a permanent deal, which he gladly accepted, and has so far endorsed with dividends on the pitch. Not only is he the club’s top assister with seven, but three of his four goals have been decisive in crucial away games. He scored the equaliser in a 2-2 draw against Dortmund, and again equalised to aid in a 2-1 win in Berlin and later did the same in Hamburg. Kovac’s eye to trust in the potential of a young, little-known player has greatly paid off. Niko Kovac’s relationship with his 24-year-old fellow countryman goes way back to when Bayern’s soon-to-be coach was in charge of Croatia’s U-21 national team. He also took Rebic to the 2014 World Cup after taking charge of the senior Balkan squad. After bringing him to Frankfurt on loan from Fiorentina last season, it’s fair to say that Rebic is somewhat of a development project for Kovac. Although last season was a mixed one for the young Croatian, he put his head down this season and fulfilled the great hopes placed in him by Kovac. One of Kovac’s secrets in getting the most out his protege is not letting the hype get to his head with some tough love. “I know how guys like Ante think”, said the coach about the youngster. “I have to poke him every now and then. I only expect that he shows what he can do. If he does, he can be one of the best 10 players in his position in the Bundesliga”. Rebic’s tally of six goals this season is his best since leaving Croatia and it might just convince the Eintracht board to make use of their buy-out option to help keep Kovac’s legacy at the club alive. The young Frenchman is yet another argument for Kovac’s savvy to foster young players from obscurity to international praise. Signed this summer from Dutch side Utrecht, Haller was dropped into the deep end as Eintracht's leading man up front from the first whistle of the season. With eight goals to his name in his first 19 Bundesliga games, the 6ft 3in tall striker was one of the biggest surprises of the first half of the season. Watch: Sebastien Haller wins 2017 Bundesliga Goal of the Year! In the ongoing second half of the season, however, finding the back of the net has proved more difficult and young Luka Jovic (on loan from Benfica) has matched his tally. They are currently the club’s joint top scorers. Whatever the outcome of their particular duel, one can only marvel at Frankfurt’s scouting and fostering policy. Niko Kovac has created an environment where new talent can blossom thanks to their mastermind's firm hand for discipline, keen tactical mind and superlative man management.